Can men tuck their pants into their boots? My husband and I found ourselves at a crossroads of opinions this weekend on a men’s fashion point. We were browsing Hermes and happened across a fantastic pair of men’s boots for winter. My husband tried them on and loved them. He stood up, pulled his pant legs over each boot and found himself intensely disappointed by how concealed all of the detailing became. You could no longer see the beautiful zipper and craftsmanship. I told him that he should tuck the pant legs in. The question at hand: Is it acceptable for men to tuck their pant legs into their boots? I also found a couple of shots that I think are amazing of men rocking this daredevil look. Chanel is reliably one of the most timelessly stylish houses to ever grace the runway. 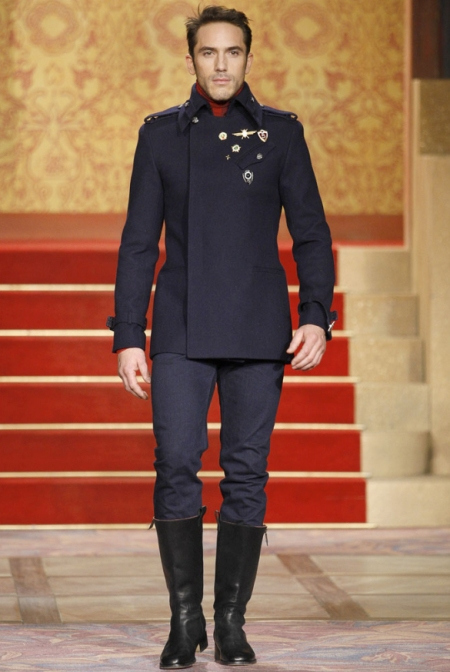 The Russian-inspired coat is a phenomenal pairing with this look, but a peacoat would be a great alternative as well. The point I am trying to make though is that the pants are tucked into the boot and he still looks masculine and stylish. It is a very European look and I adore it. Now, this one is a little bit more of a fashion risk, but I also love this look (minus the chain wallet, please). I agree with Madeline in that the acceptability of these looks is heavily dependent upon the cut of the pant and the height of the boot. Those two details being properly addressed though, I think it is absolutely acceptable for men to tuck their pant legs in and show off some awesome leather! This entry was posted on Monday, October 22nd, 2012 at 11:30 AM	and tagged with boots, fashion, men, trends and posted in Fashion. You can follow any responses to this entry through the RSS 2.0 feed.